In May 2003, the largest gravesite in South Africa to have fallen off the official radar was accidentally unearthed by a developer on private land at the corner of Prestwich and Albert Street. The human skeletal remains dated to the 1700s and were those of people who fell outside of the official church and Dutch East India Company establishment – slaves, infants, convicts, dispossessed Khoi-San, passing sailors. As the M&G reported at the time, it was a test case for the South African Heritage Resource Agency and legislation around the dignity of human remains. The earliest burials (found at Cobern Street amongst later colonial burials) are of the shaft type used by the Khoekhoen, and date back to over 1000 years ago. The resulting debate (or crisis for the developers), amidst protests, night vigils, and ill-timed rains, entangled government bureaucracy and a public whose dignity had been repeatedly denied and abused for three centuries with the economic and infrastructural needs of a city soon to host the FIFA World Cup. The protocols around disinterment and re-interment of human remains that arose from this historic collision will continue to govern for some time. The end result was the Prestwich Memorial, developed as a permanent place of rest for the forgotten souls of District One. It is on the site of the first formal cemetery hastily opened in response to the smallpox epidemic of 1755. The ossuary, in the form of a ramp descending underground lined by a timber shelving system for the storage of some 4500 boxes of remains, hopes to act as an interpretive centre for learning and memory. So-called “invasive” laboratory analysis of the remains was ruled out. Scientists have argued that this was a missed opportunity to understand more about the past and to interrogate the dominant historical perspective. Archaeologists meanwhile have found both VOC and Mughal Indian coins on the eye sockets of the dead. Sharpened and patterned teeth indicate slaves from elsewhere in Africa. The little museum is an on-going project. The displays are informative, fascinating, attractive, and well-thought out. Although they focus on the site and its surroundings, they tell the broader story of the Cape. It is well-worth spending some time here, and if you do, you can keep yourself invigorated with the excellent artisanal coffee served at the aptly named Truth and Coffee cafe, launched a little over a year ago by “coffee evangelist” and radio talk-show host David Donde. There are umbrellas and outside seating in the public park. Inside, where the museum displays are located, you can relax or work in the Wi-Fi spot, on funky if somewhat flimsy, pressed-wood, designer furniture. Order at the counter. They use the coaster call system here, which lights up and vibrates when your order is ready. The coffee is roasted on site, and if you’re lucky enough you can witness the process some afternoons employing their vintage Probat machine, to which has been added some modern electronics to improve control. The drum is still cast iron, before steel took over in the 1960s. According to the team at Truth, it is easier to roast in – the iron giving radiant and convective heat, which possibly explains why they detect an improved taste. Green coffee beans are uneatable never mind undrinkable. Roasting at temperatures up to 220°C for anything from 2 to 15 minutes transforms them. First the beans puff up, then the sugars and proteins brown – the hotter the darker the beans. As oils escape, the beans get that glossy look. By this process flavour and aroma develop, at first tart, then they start to blossom, but if roasted for too long, become bitter once again and lose body. The flavour of poor quality beans can be improved by judicious roasting, but equally, good quality beans can be destroyed. Truth offer five blends for sale, each with a catchy appellation. Resurrection, is the house blend (espresso); Vengeance, for filter or French press, a ‘forgiving’ blend; the decaffeinated Antithesis blend; Donde’s Chaos, described as ‘charismatic’; and finally, their Organic. For breakfast, you might try their large croissant filed with scrambled egg (really a soft omelette) and rashers of pink, rindless bacon. 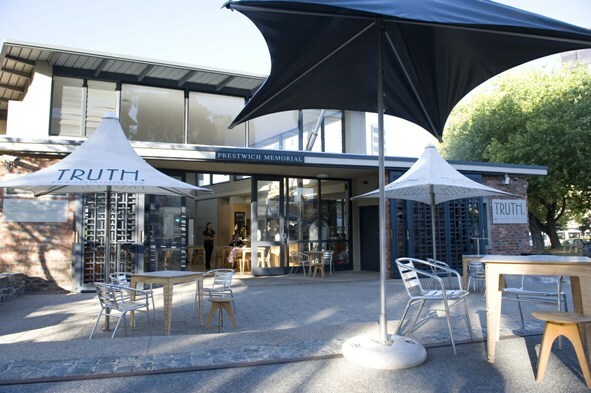 With coffee on tap and some great snacks at hand, one may easily spend a morning visiting the Prestwich Memorial and then set off on a historical walk following the many significant historical landmarks that lead one to the V&A Waterfront. Truth. Prestwich Memorial, 1 Somerset Road, Green Point. Tel: 021 419 2945. Open Monday to Friday from 7am to 5:45pm; Saturday and Sunday from 8am to 2pm. This article first appeared in the Mail & Guardian on 15 April 2011.